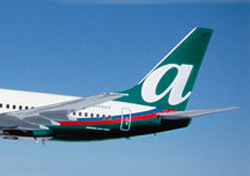 AirTran announced it has completed installation of in-flight Wi-Fi on all 136 of its aircraft. With apologies to Virgin America, which has had in-flight Wi-Fi on its fleet of 28 aircraft since May, this makes AirTran the first truly national carrier to offer fleetwide Internet. AirTran surprised the industry in May when it revealed it had been secretly installing the service and would be finished in two months. Of course, AirTran’s moment in the sun won’t last. Delta and American are racing to equip their (much larger) fleets with the service, and may get there by the end of the year. Southwest is currently testing in-flight Wi-Fi. JetBlue has also dabbled in onboard Wi-Fi but has apparently gone no further than equipping one plane with limited service. But for now, it’s AirTran leading the way. The airline is marketing its new service with a series of videos, titled Internetiquette, that humorously caution passengers about the pratfalls of using in-flight Wi-Fi. These accompany a brochure with equally witty (but ultimately serious) rules and usage suggestions to be placed onboard the carrier’s aircraft.